I've been thinking more about the whole concept of branding and reality over the last few days, stirred by two separate but conceptually linked inputs. The first came in the latest propaganda circular from the Central Committee of the Chinese Communist Party. Here in DC, we get those every week or so, pitching out the party line through the "China Daily," which is inserted into local newspapers as if it were the Sports Section. I read that Chinese propaganda in the same way I used to read English language versions of Pravda back in the 1980s, as a fascinating insight into the falseness of manipulative writing. The article that struck me was a discussion of a study conducted for China's communist leadership by a US marketing firm. Yes, you read that right. Ours is a very strange world these days. Here a mea culpa: I'd link to it, but China Daily is...well...it's a twitchy website. Things shift and change on Official Dot CH websites, and danged if I could find the "article." I fear you'll have to trust me on this one. The study revealed that China has a problem with "negative brand perception." Meaning, Americans and Europeans perceive Chinese goods as of inferior quality, and associate them with oppressive working conditions. Overcoming that perception, the marketing gurus suggested, is key to China's export success. This is all about "perception," mind you. Ahem. That then played off of another story this week. In Australia, the conservative government there has been coming down hard on US tobacco producers in an effort to reduce Australian lung and mouth cancer rates. 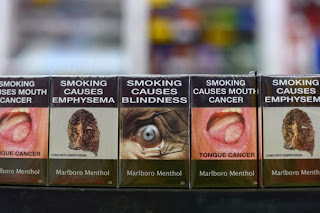 Now, in addition to the nasty, nasty warnings that cover the entirety of cigarette packs, recent Aussie legislation has mandated that cigarette packs use a drab, standardized font. No more brand identity, beyond the megabrutal Aussie cancer-stick packaging. Tobacco producers, including US businesses and the government of Communist Cuba, have taken this as affront to the rights of brands to manage their own identity, and is resisting it in international courts. How can we sell our product if we can't brand differentiate? It's a violation of international treaties! What right do you have to tell us who we are? Here again, there's a peculiar partnership of marketers and propagandists...one that places the spin of branding over and above the reality that brand masks. And I find myself thinking about corporations as persons, and just how existentially meaningless the concept of "branding" is. Is a brand the reality of a corporate culture, representing the actuality of how that entity impacts the world? Then it's a real thing. But if it is not, if "brand" is simply an illusion cast to serve profit or power, then it is something else entirely. It can be a false face, a mask that plays off of the manipulated fears and desires of those it encounters. There are human persons like that, of course. We know them. They're the folks who are all image, all fluff and bluster. All hat and no cattle, as my Texan ancestors would have put it. As a Christian mystic, I tend to believe that those human beings have a difficult encounter with their Creator when the veil of our mortal subjectivity falls away. God knows our true selves, the selves etched into the Real. The lies we tell ourselves and others shatter against the reality that God knows and will share with us fully. It is the most terrible thing about God, for we creatures who like to pretend we are other than we are. And as it is with people and their projected identities, so it is with the brands of corporate "persons." If the reality of a brand is injustice and oppression, or the reality of a brand is sickness and death? Participating in those falsely cast images won't fly with our Maker, no matter how vigorously we spin and market and manipulate perceptions.